This episode of Whine Wednesday we are visiting the Grand Club of an unnamed Hyatt Hotel where I am currently staying. I was working at the lounge yesterday afternoon when the gentleman pictured above brought in his lunch in containers and consumed it there (with full knowledge of the staff). It was some ready made dish in styrofoam containers and smelled absolutely disgusting, the whole lounge was covered by the scent. Any common sense forbids to take such food anywhere else than a designated dining hall or your own home. 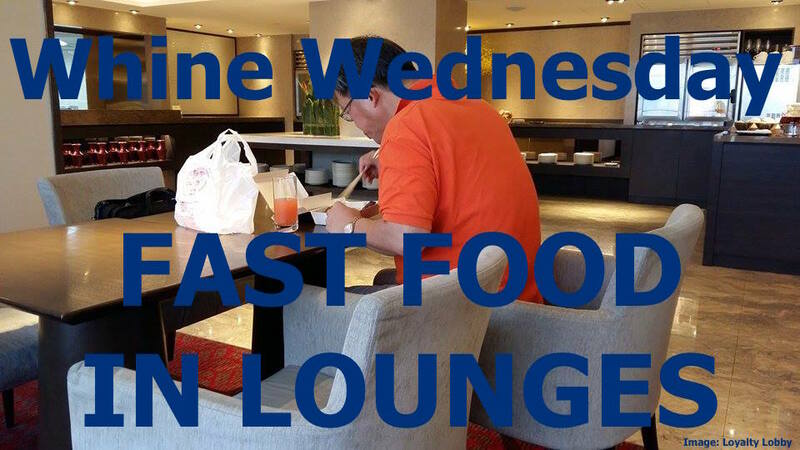 It is beyond me why the lounge staff would even allow this guy to bring in his awful smelling stuff when the (written) rule is that no outside food is allowed. On top of that, the whole lounge was empty so why would you sit right next to the only guest to share your ‘dining experience’? Occasionally I have ordered hot dishes from the hotels restaurants or via room service to the Club if that was permitted, simply because the evening spread was nothing to write home about or I was hungry outside those hours. Regular restaurant food however smells relatively neutral, not comparable to opening a container full of junk food or some oily food court meal. In simple terms: It was just revolting. It should be absolutely prohibited that outside food (hot dishes) is being consumed in shared spaces such as club lounges, aircraft or trains. The staff should be authorized to actively enforce this rule and eliminate the offending source either by disposal of the food (through the guest) or by asking the offender to leave for the time being.